Morgan James Publishing, 9781683505938, 686pp. 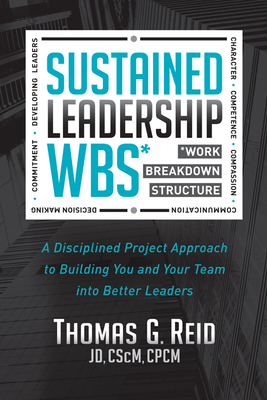 The Sustained Leader WBS provides a comprehensive tool for assessing and improving leadership potential. A Work Breakdown Structure decomposes every part of the work to be done in a project. Through extensive research and surveys the author has identified 226 WBS elements that apply to building yourself into a sustained leader. Each element provides a self-assessment, additional resources, and a place to record personal goals and due dates giving each reader a personal program plan to build themselves into a better leader. Tom Reid has over 35 years of experience in leadership and has written four previous books as well as book chapters, and more than two dozen articles related to business, contracting, government, and leadership. He holds a BA, JD and MPA. His current work is devoted to the subject of developing yourself as a leader, a subject Reid has taught for many years and demonstrated in the many leadership roles in which he has performed.